12 days, countless teachings, from Syrian border to the Judean desert, School of Ministry came to it’s end last week and left me with information and revelation overload! I am beyond blessed and thankful to have been a part of such an incredible group of teachers, volunteers, tour guides, bus drivers and students from over 10 nations. Hearing God’s heart for Israel, seeing the one new man, seeing God gather His people…I am reminded of a God of faithfulness, a covenant-keeping God, a God who’s word and character is the same yesterday, today and tomorrow, a God that is true to His every promise, a God that I can personally call, Father. Of all the amazing teachings in 12 days, God showed me something during that time that couldn’t be taught in words…His love. Every day I wake up before dawn, usually to crying babies, slamming doors or a mother yelling at her child in a language I never understand. I wake children up when it’s my turn, get them ready for school, make their lunches, send them off and head to prayer for an hour. 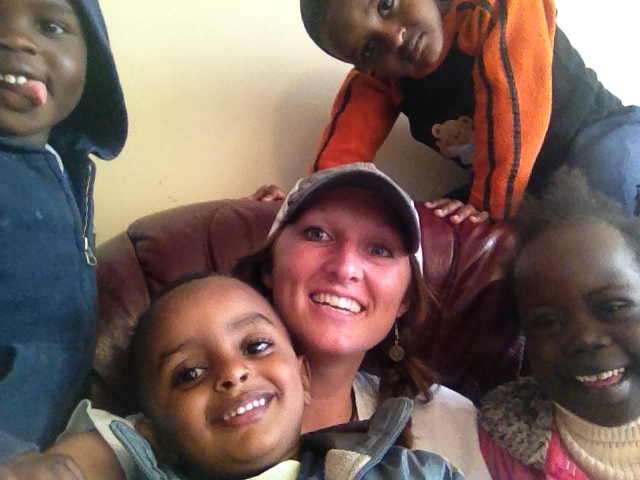 After prayer it’s off to gather the little ones while their mom’s (those who have moms) sew, clean or cook. I sing, I dance, I bark, I meow, I jump, I get my hair pulled, I get peed on, nose wiped on, cried on…and I do it all day, every day. By the time the school of ministry came around I said to myself, wow, this will be a nice break from all this! The first day came around and all I could think about was getting back to the children, the second day I was running to greet them, 3rd, 4th, I couldn’t help but go sit with them and dance with them on worship night…I fell in love with these kids like I never thought I could. Sidenote, I NEVER had ANY desire to work with children in ministry! I love children, yes, but all day, every day…well, I was waiting for motherhood for that one. Long story short, I asked the Lord what He was doing. Was this a place He would be bringing me back to serve? As many of you know, I’m a big, “I need confirmation” kinda girl, so that’s exactly what I did. God, if you want me to return and serve long term on a student visa while learning Arabic, deposit the application fee for the University in my account…let’s just say, in less than 24hrs God spoke. A random amount was deposited into my paypal account and I was thinking, did I really ask the right confirmation??? I don’t like coincidences so I asked again, God would you give me a shooting star if you want me to return?! That morning, as I was sitting in the teaching in the sanctuary I was staring at a projector screen with a background picture of a night of stars. Suddenly I noticed what looked like a picture of a shooting star across the screen that wasn’t there just moments before. I thought to myself, I’m surely losing it but couldn’t take my eyes off it and why the other screen that had the same picture didn’t have what looked like a HUGE shooting star across the screen. After about 10minutes of being distracted by this beam of light shooting across the screen I realized it was a ray of sun shining through the windows in the building that lined up PERFECTLY with a large star on the top of the screen and expanded to look like a shooting star across the screen…really?!? I thought to myself God must really be laughing at me right now. Like, do I really need another confirmation? A deposit, a shooting star…not to mention what the BIBLE says about taking care of the widow and orphan. God has opened up a door for me to serve here longterm while studying Arabic at the local university. I am only one person, and I may not be able to change the world, but if I can love and encourage and equip a next generation, even just 1 person to want to do the same, I might get to experience what Yeshua Himself experienced…making disciples of all nations. I would like to ask you to partner with me in prayer as I begin preparing for my return to the states in just under a month now. I will be traveling from Israel to CA to WI and then finally back to FL for the summer. Pray for God to open doors to minister His love and truth wherever He has me. I am so blessed to have the prayer and loving support that I have from so many family and friends and I can’t thank you enough for your cards, emails, encouraging words and messages. You are on the frontline with me and I hope to share so much more upon my return about all the Lord is up to in the nation of Israel. 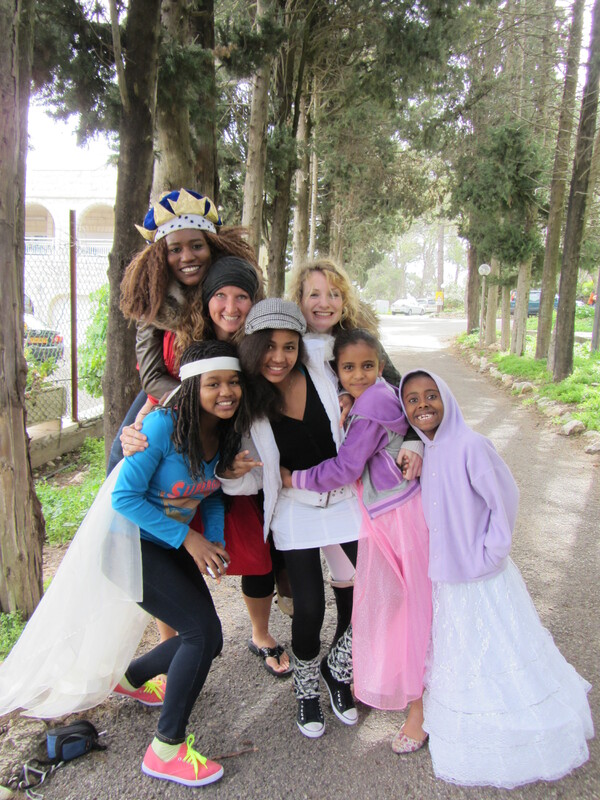 I am officially 1 month into my “new normal” here on Mt Carmel in Israel. I can’t thank you enough for all the prayers and support. I know the Lord hears each and every one of your prayers and has strengthened me when I was weak, healed me when I was sick, increased my patience, and given me an endless supply of love to pour out over every person I come in contact with. Glory can only be to God for all the wondrous works that take place in Israel. I want to share something the Lord has been speaking to me regularly here…through a photo I took in August on my US road trip. This photo was taken in Berea, Kentucky…a tree that grew out of a rock. Last week a visiting minister came to speak to the women here. Women who have been smuggled, raped, tortured, trafficked and forgotten. Women who have what the pastor described as a “hard heart”. He explained to one of the staff members that he probably wasn’t here to reap a harvest, but to water a seed…a seed that was planted possibly the day they were brought to safety, given shelter, clothed, fed, loved and adopted into a family here on Mt Carmel. This pastor may never see them come to know Yeshua, but he faithfully comes again and again to water a seed. If you were to look at a rock through a microscope you would find many cracks, almost as though the rock is filled with a capillary system much like a human. In moderate climates, trees produce seed in autumn, when the rains start. 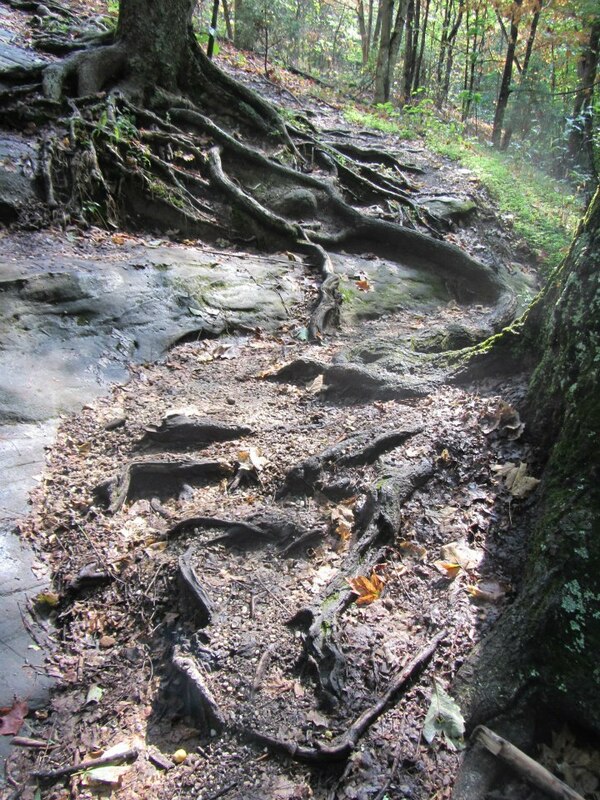 From October to March, the rock becomes humid and pushes forth it’s first root looking for water. Within 1 day a new root can be seen. This root is capable of developing pressure of over 725psi, over twice the pressure of the Union Pacific Big Boy steam locomotive boiler, or over 10 times the pressure of a bicycle tire! The roots develop in the winter but the leaves don’t. The roots are absorbing water to build up strength for it to develop in April when it gets warmer. When it gets warmer the plant releases the water it has stored up to protect itself in drought and also cool itself…am I the only one that thinks this process is absolutely amazing?!? God created a plant so that in a cold, harsh season it could strengthen and store water to develop itself when the weather turned warmer and it could produce fruit. Are you paralleling this with your own life yet? So, here I picture this little seed flying through the air, planting itself in this tiny microscopic crack in a big hard rock. I see a pastor faithfully speaking to women week after week with no evidence of fruit…yet. I see a small root pressing through the rock in a cold, dry and thirsty place looking for water and finding the “reign”. I see children being loved day after day, their souls being watered when inside they were dry, forgotten, lost, left behind, or unloved. I see the roots being strengthened, built up, being equipped for their next season…the next season where it releases what’s been stored and begins to produce and then reproduce. Under the pressure of the world, the pressure of pasts, pressure of people and pressure of the enemy I see a fruit produced and multiplied that no “hardened heart” no enemy can stop, the next generation of pastors, leaders, evangelists…sprouting from a Rock…because someone looked past the hard, cold, rough outside and watered the seed within. Be encouraged today. Every nose you wipe, every tear you catch, every smile, hug, kind word, glass of water you give…you are watering a seed in eternity, a seed that will one day reproduce. The Lord sees it all and it is not in vain. Don’t miss an opportunity to bring the “reign” into someone’s life today. My apologies for not updating everyone on my blog. It’s been an action packed couple weeks thus far where I have been blessed and I have been challenged, I have had laughter and I have had tears. I truly feel like this is my home away from home. I left Florida with my 2 favorite little boys, Matthan and Asher only to be replaced (though they could NEVER be replaced) with a dozen little boys and girls that bring me so much joy. I am a friend, a sister, a mother, a mentor, a janitor, a cook, and a maid just to name a few of my roles. But, most importantly, I have the opportunity to be the love of Christ, to serve and to experience and grow in Him through it all…there are no words to express the things you learn from being with children all day every day. Mom’s I gotta hand it to ya, you’re AMAZING!!! This will be a short update as it has been a long day and I’m battling a sinus infection. I would like to ask for continued prayers for health. One of our babies is in the hospital with pneumonia and many of the other children have coughs and sniffles. It is a battle to stay healthy around so much sickness but standing on the Lord’s strength and healing hand in our lives. Also, please continue your prayers for Israel. There has been some action on our northern border and we are all just continuing to stand in the gap for this nation. Love you all and so thankful for your support and prayers!! Today is the day, I can hardly believe it as I sit here at the airport waiting for my flight. In 88 days I will return to the US with stories of what God is doing in Israel I have no doubt. Today, however, I am just thankful that even when my scatter-brained self leaves my jacket with my passport, my boarding passes and all my cash at security…that the Lord so gently reminds me with that still small voice, “Jill, feeling a bit chilly?! It’s because you forgot your jacket…and passport…and cash…and boarding passes!! !” Haha thank you Jesus! I cannot thank each and every one of you enough who are praying for me. I feel like I’m soaring through this transition on eagles’ wings. I have a peace that is truly supernatural. I know I do not go alone. God is sending an army before me and with me…it’s as though I’m a little girl and daddy is fighting off all the bad guys as he hides me away under his arm. Thank YOU for enlisting in this army!! It’s the start of another new year. It’s as though we take 1 day and believe for a new beginning. We make goals, resolutions, we strive to be thinner, more organized, more lovable, more loving, healthier, and so much more…because of 1 day. There was 1 day that I don’t remember. I wasn’t born yet. I wasn’t around and neither was any of my family, but I remember a day that has been talked about since…even before that day. It was a day that the world changed. It was a day that the atmosphere around changed, the earth trembled, the sky turned dark, and there was a man who was crucified for what we all strive to be and do on that one day. To be a better person, to forgive, to forget, to break addictions, to heal relationships, to be healed, to be…loved. WHAT’S gonna be different about THIS year?!? So, what does today, the first day of the new year have that the last didn’t have…the year before that…and the year before that? What do you have now that you didn’t then? If nothing’s changed than what do you expect of your new year? How many years have you wished things, dreamed things, set goals, written out workout schedules only to fail once again? What is going to be the difference this year? I challenge you to take your goals, your resolutions, your dreams, and the visions you’ve been holding onto for years and bring them to the feet of Jesus this year. I challenge you every day to open your Bible and find encouragement to believe in what you wish to do or become. I challenge you to pray every day about your dreams. I challenge you to ask God for open doors to your heart’s desires. If there is one thing different about your diet this year, fill yourself up with the WORD and just see where it takes you. I’m praying that ALL your dreams come true. I pray you get that job, you start that business, you lose the weight, you rekindle lost love, you forgive, you reach your goals, your addictions be broken, you get out of debt, you get more organized, you manage stress better, you spend more time with family and friends, you find your husband/wife, and above all that you find not just happiness, but a joy that keeps you smiling even when times are bad, a peace that surpasses all understanding. This year, ask God for help…what do you have to lose? Praying God’s very best for you in 2013! …They tell me this is just a season, but that doesn’t change the way I feel. They say God is bigger than my trials, yet I still face them every morning. They lay hands on me and pray for comfort, for healing, for joy, but darkness closes in. I search for the why, the how long and the what to do…but the silence is deafening…. Have you ever felt like this or known someone who has? Have you ever experienced the lovely old saying, “when it rains it pours”? If not, feel free to leave my blog now and thank Jesus for the amazing season that He has you in…but if you’re one of the other millions of people on this planet who are struggling or know someone who is, I want to share something God spoke to me recently. 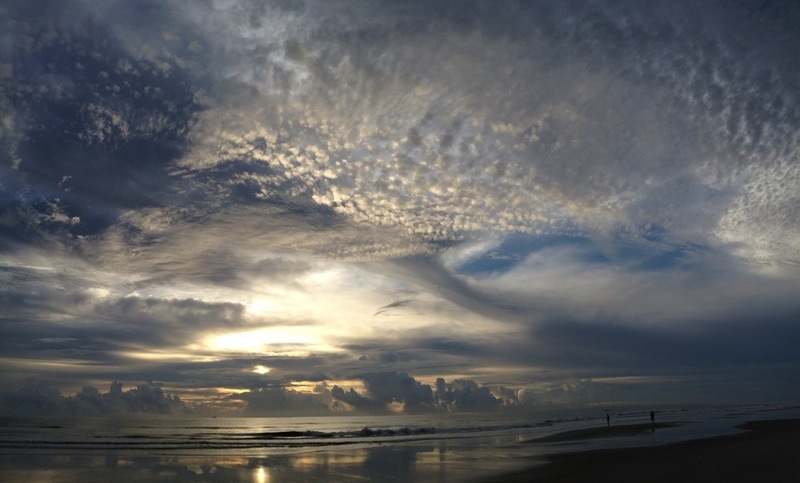 This is a picture I took recently of a sunrise in Neptune Beach, FL. 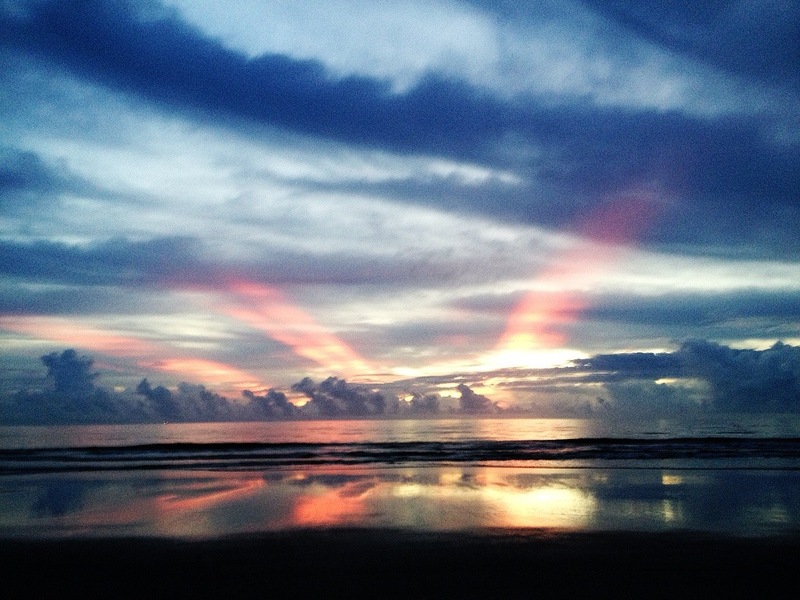 Every morning I jump out of bed, into my car and head to the beach for my sunrise walk with Jesus. This particular week was filled with storms, dark clouds and lots of rain. What you don’t see in this picture, like, if you were to turn my camera 180%…you would see black. You would see a wicked storm rolling in from the west with sheets of rain and thunder and lightning. Yet, what many dog-walkers, runners and photographers soon forgot about towards the west, became one of the most breathtaking sunrises we’ve ever seen towards the east. At that moment, I stopped walking, watched every ray of sun slowly pierce every dark cloud in the sky, shooting forth rays of the most beautiful oranges and reds and pinks I’ve ever seen. Joggers stopped jogging, people forgot they were even walking dogs, photographers held their cameras steady for that prize-winning photo moment and every walker’s eyes were turned to the light shining through the darkness…and God spoke. Notice, you WILL have tribulation…but in Him (who has overcome the world) you may have peace. So, what are the trials and storms in your life revealing about your relationship with God? Has your world become dark, your witnessing become silent, the storms too heavy to fight off the ever so isolated corner of your house? As the storm on that cloudy, dark and rainy morning revealed a light so bright for ALL on the beach to take notice…so should our lives shine through the dark and stormy times in our lives. How we react to PROMISED trials and tribulations in our lives is a direct reflection of our relationship with the Father. Do you cope as the world copes, maybe with alcohol or food or complaining? Or is your hope and peace found in the One who has overcome? God does not allow storms in our lives so we can run for cover. He allows them so we might shine through the darkness for ALL to see that they may glorify our Father in Heaven! The following day, the storms cleared. What people kept talking about wasn’t the storms…come on, it’s Florida, we KNOW storms will come…what the people kept talking about was the light that shone through the darkness, the rising of the sun. Would you rather have people talking about the storms in your life, or the SON that rises in the midst of them??? Let your light SHINE! Here is the sunrise the following day. I feel the need to write this post as a post of encouragement and teaching. I can’t count the number of times I’ve been asked the question, “how do I hear from God?” Or, “did I hear God right?” Let this encourage you to seek after Him and be CONFIDENT in His voice, His calling and His direction in your life. I can’t tell you how many times I’ve been so confident in what I’ve heard from the Lord, ran full speed after what He was showing me and when I arrive to what I believe to be exactly what He had planned, everything falls through, plans change and I find myself doubting that I heard from The Lord in the first place. Can I get an Amen?! In Genesis 22:2 it reads, “Then He said, ‘Take now your son, your only son Isaac, whom you love, and go to the land of Moriah, and offer him there as a burnt offering on one of the mountains of which I shall tell you. '” God is CLEARLY telling Abraham to sacrifice his only son, Isaac. In the very next vs it says he arose EARLY. Abraham was confident in what he heard from The Lord and was pursuing it first thing in the morning…confident is the key here! Wait a minute, but didn’t God tell Abraham to sacrifice his son? Didn’t Abraham confidently hear from the Lord, listen in obedience and now…it’s not happening?!? Here’s where Abraham starts doubting that he heard from God, right? Here’s where Abraham is embarrassed because he was wrong in his direction right? NO!!! I love this next part…vs 17,18 “blessing I will bless you, and multiplying I will multiply your descendants as the stars of the heaven and as the sand which is on the seashore; and your descendants shall possess the gate of their enemies. In your seed all the nations of the earth shall be blessed, because you have obeyed My voice.” Blessings upon blessings upon blessings, why? OBEDIENCE!! Confident OBEDIENCE!! If you are reading this blog right now it’s because God wants to speak a word to you. Or maybe He already has and you just needed confirmation…here it is! If God has given you a word, a direction, or commanded you to do something (Jesus is not asking you to sacrifice small children don’t take this the wrong way), it is your obligation to follow through with that in obedience. Be confident in His voice and don’t allow the enemy to reroute you into disobedience so you miss out on the blessing. Blessing comes through obedience! The Lord is moving me to Israel in January. I can’t tell you how many people have voiced their concern and asked me not to go. I am beyond appreciative of their love and concern for my well-being. However, my response is this…I would rather die being obedient than live in disobedience. I am living in abundant blessing not because of my work, my friends or my lifestyle…I live in abundance because I strive to be obedient to whatever the Lord leads me to do, whatever, wherever and however that looks and I want to encourage you to do the same. Be confident in Him, know His voice, and be obedient to His word. 4. Abraham questioned whether he heard from God…NOT! You know His voice…listen to Him and be confident in that!